On Sunday, three Newmarket Joggers joined 13,657 others for the first of the big spring marathons, the Asics Greater Manchester Marathon. Paul Dockerill went out at a lively early pace and held on well for a new PB of 3:21:35, beating his previous best by over 2 minutes and finishing 371st of 1,478 in his MV40 age group. Also performing well in the same age group was Simon Harris (3:27:32) in his first recorded marathon to date. Caroline McIntosh (5:38:44) put in a good effort among a high class turnout in the FV65 age category, with her Berlin Marathon last September remaining her PB race of 5:24:01. On the same day, conditions were perfect for the popular local off-road Cambourne 10K, in contrast to the soggy mud and puddles of last year. Adam Maltpress led the Joggers home in 43:44, 67th of 705 overall and 19th of 100 in MV40, from Andrew Taylor (46:26), Joe Cormack (49:00), Dave Crowley (52:26) and Chris Aylmer (56:13). Meanwhile, several Joggers took part in the Haverhill Running Festival. In the challenging, hilly HaverHalf (13.1m), Craig Ladley was first home in a time of 1:43:37, 19th of 126 overall. Next came Miles Johnson (2:00:06), Lynda McCormack (2:09:13) and Mary Marsh (2:16:12), who all did well in their age categories. Gillian Green (1:12:39) opted for the equally hilly 10K event, finishing in 1:12:39. Lisa Jennings competed in the First-Sunday-of-the-Month 5K and 10K event at the Great Barrow Challenge HQ in Barrow, near Bury St Edmunds. She clocked 30:49 in the 5K and then, 30 minutes later, 1:00:48 in the 10K, so did very well to complete the 10K at a quicker pace. 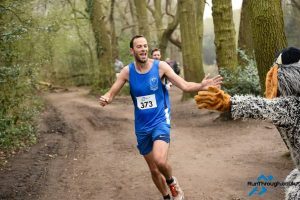 Down on Wimbledon Common, South London, Henry Hamilton-Gould put in a top performance in the Trail Half Marathon. He finished in 1:31:26, 25th of 714 overall and 5th of 71 in his MV35 category, just 2 seconds outside his PB this year, which is commendable in an off-road race.